January = new year, new resolutions (hopefully some we all manage to hold!) and my main focus in 2019 is making space for myself in the mornings. I’m working on improving my mornings so my days are ultimately more productive and my headspace is ready for whatever it is I’d like to achieve. My goal is to wake up at 5:30am. I’m currently at 6am but getting closer. Waking up earlier allows me to make time for myself before work and create a positive routine. 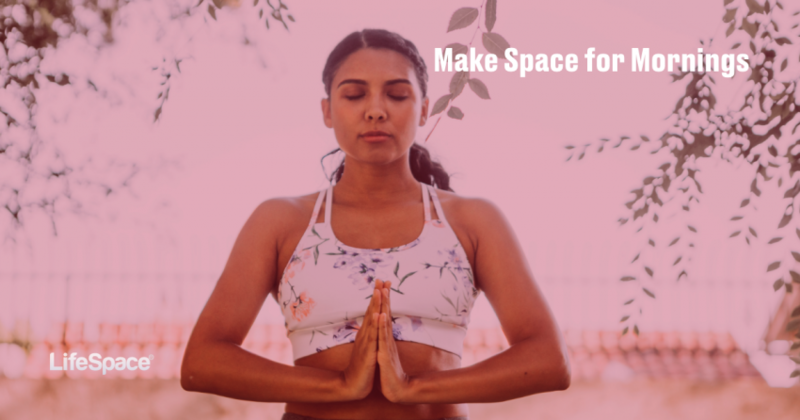 Start with a couple of minutes of meditation — whether that means simply taking deep breaths, listening to soothing music or focusing on what I’m grateful for. My goal is to not touch my phone during the first half an hour of every day, because that’s a bad habit of mine. My inbox can wait! Exercise at the gym. I love a quick HIIT session if I have the time but no matter what, I’ll exercise 30 to 45 mins. After a good workout and warm shower, I feel like I have my life together! I only became a morning person in the last year as I was winding down my study years and with this newly discovered time, I started exercising early before work each day. We always think of the physical benefits of fitness, but for me, the main benefit was mental. Incorporating this positive habit into my routine, I started feeling better in all aspects of my life, discovering that I become more confidence at work and in my personal relationships, so I want to continue this habit in 2019. I’d love for people reading this thinking “I’m not a morning person or a fitness person” to know that I wasn’t either of these things only a few months back. I suggest finding any activity that fits you and choose the best time of day to establish a realistic routine. If that’s morning, great! If that’s 10pm go for it! Personally, I never considered myself athletic, but I started exercising when I had a high level of stress in my life and can’t emphasize enough how much it helped me to deal with the constant stress and anxiety I lived with every day. ANY type of physical activity done at ANY time of the day will help you feel better, sleep better and just be happy. Remember you need to start somewhere and as long as you keep going, it will become a habit before you know it! I think LifeSpace could be a good place for me to sync everything I care about; my job, my entrepreneurial journey, my fitness, and nutritional goals etc. I do feel like I use different tools to take care all of these different aspects in my life and it would just be easier to have it all in the same space so I’d actually save time.